32GB of Internal Memory - Some of this memory will be reserved for use by the system, but storage can be expanded with microSDXC cards. According to GameInformer, a reprentative from Nintendo confirmed that the Switch will allow for 2TB microSDXC cards. Communication Featuers - Wireless LAN (IEEE 802.11 a/b/g/n/ac copmliant) / Bluetooth 4.1 (TV Mode Only) Wired LAN Connection possible through Wired LAN Adapters. Audio Output - Supports linerar PCM 5.1ch via HDMI in TV Mode. USB Terminals - USB Type-C Terminal, used for charging or connecting to the Nintendo Switch dock. Battery Lasts More Than Six Hours - Some more intensive titles will reduce the battery life. For example, The Legend of Zelda: Breath of the Wild when played mobile may only last for around 3 hours. 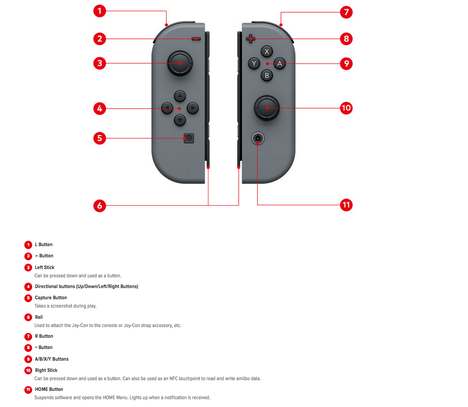 This only applies while the Nintendo Switch is removed from its dock. 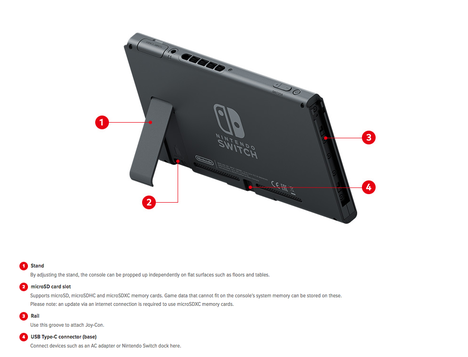 The Switch itself (just the handheld screen) includes a slot for a microSD Card and a USB Type-C Connector. 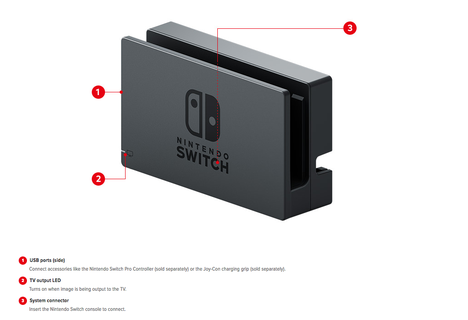 The Nintendo Switch Dock includes two USB 2.0 Ports and a TV Output LED in the front. 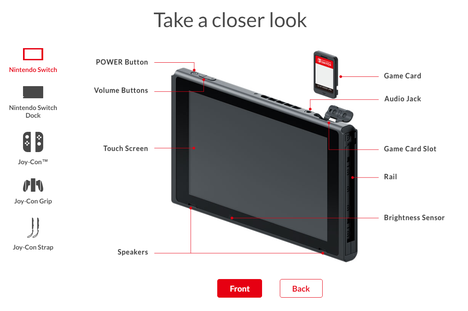 Beneath the back cover, there's an AC Adapter Port, a USB Port, and an HDMI Port. Connectors - Two USB 2.0 compatible ports on the side, One on the back (USB 3.0 support will be added in a future update).